Farrar, Straus and Giroux, 9780374236915, 112pp. 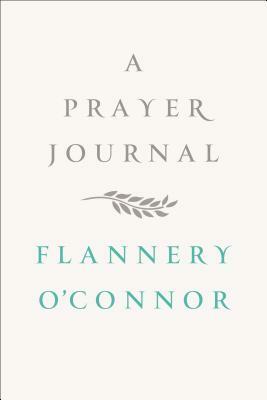 "I would like to write a beautiful prayer," writes the young Flannery O'Connor in this deeply spiritual journal, recently discovered among her papers in Georgia. "There is a whole sensible world around me that I should be able to turn to Your praise." Written between 1946 and 1947 while O'Connor was a student far from home at the University of Iowa, A Prayer Journal is a rare portal into the interior life of the great writer. Not only does it map O'Connor's singular relationship with the divine, but it shows how entwined her literary desire was with her yearning for God. "I must write down that I am to be an artist. Not in the sense of aesthetic frippery but in the sense of aesthetic craftsmanship; otherwise I will feel my loneliness continually . . . I do not want to be lonely all my life but people only make us lonelier by reminding us of God. Dear God please help me to be an artist, please let it lead to You." O'Connor could not be more plain about her literary ambition: "Please help me dear God to be a good writer and to get something else accepted," she writes. Yet she struggles with any trace of self-regard: "Don't let me ever think, dear God, that I was anything but the instrument for Your story." As W. A. Sessions, who knew O'Connor, writes in his introduction, it was no coincidence that she began writing the stories that would become her first novel, Wise Blood, during the years when she wrote these singularly imaginative Christian meditations. Including a facsimile of the entire journal in O'Connor's own hand, A Prayer Journal is the record of a brilliant young woman's coming-of-age, a cry from the heart for love, grace, and art. Flannery O'Connor was born in Savannah, Georgia, in 1925. When she died at the age of thirty-nine, America lost one of its most gifted writers at the height of her powers. O’Connor wrote two novels, Wise Blood (1952) and The Violent Bear It Away (1960), and two story collections, A Good Man Is Hard to Find (1955) and Everything That Rises Must Converge (1964). Her Complete Stories, published posthumously in 1972, won the National Book Award that year, and in a 2009 online poll it was voted as the best book to have won the award in the contest’s 60-year history. Her essays were published in Mystery and Manners (1969) and her letters in The Habit of Being (1979). In 1988 the Library of America published her Collected Works; she was the first postwar writer to be so honored. O’Connor was educated at the Georgia State College for Women, studied writing at the Iowa Writers’ Workshop, and wrote much of Wise Blood at the Yaddo artists’ colony in upstate New York. She lived most of her adult life on her family’s ancestral farm, Andalusia, outside Milledgeville, Georgia. W. A. Sessions is the Regents’ Professor of English Emeritus at Georgia State University. He was a personal friend of O’Connor and has become a scholar of her work. He is the editor of O'Connor's A Prayer Journal.